Regular Baptist Press published this booklet in 1973. It was for the purpose of keeping the GARBC churches informed of various issues at the time. They include: evangelism and missions, the ecumenical movement, the charismatic movement, alcohol, drugs, the sexual revolution, race relations, divorce, the occult, church and state and social responsibility. It is interesting to see the way some issues change over the years and others don’t. This issue was very cautious about questionable social issues but very direct on things such as ecumenicity or separation of church and state. The best section was on the charismatic movement by Robert Lightner. His reasons for sign gifts ceasing makes this booklet worth having. This is an excerpt from a larger writing of Rev. Reid in 1866. His preface is signed, 3 George Square, Edinburgh, January 1863. I happen to know where that is. I thought this booklet might be about a defense of the blood of Christ, whether He literally took it to heaven or not, or something like that. But no, this is an excellent treatise on the all-sufficiency of the blood of Christ for salvation, that it alone can save without human work or merit, written in that old Scottish style. A real blessing to read. The copy I have was printed by Liberty Bell Press, Florissant, MO, in 1966. This little booklet is a short treatise on 1 Cor. 13, “The greatest of these is love.” Scripture Truth printed this edition and it has a forward in it from D.L. Moody in which he said, “It seemed to me that I had never heard anything so beautiful, and I determined not to rest until I brought Henry Drummond to Northfield to deliver that address.” It is very good on the aspects of love. I thought the gospel explanation at the end was not as good. 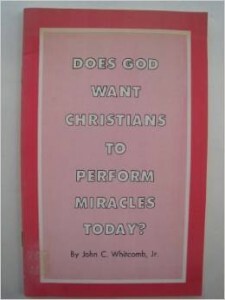 By John C. Whitcomb, Jr.
Dr. Whitcomb wrote this in 1973 while still teaching at Grace Seminary. Here he gives the common but good reasons for a cessationist point of view. He has a great section of the “greater works” of the gospel of resurrection superseding apostolic miracles and an appendix from B.B. Warfield from his book on Miracles about history’s testimony to miracles ending with the apostles. This is a 1940 study on Daniel’s prophecy from Dr. McClain. Here he defends the traditional “gap interpretation” (as he calls it) between the 69th and 70th weeks. He follows Sir Robert Anderson’s chronology for the timing of the weeks (The Coming Prince). Among many great points, I liked his defense of the Antichrist being revealed immediately when the covenant is signed and his reasons for placing the middle of the tribulation period in Revelation chapter 11 with 42 months past and 1260 days to go. This booklet was printed in 1979 by Sumner, the then editor of The Biblical Evangelist. Sumner was addressing the growing problem of the KJV Only position within Fundamentalism. The booklet is a good summary of the fundamental position and shows that major schools and people within fundamentalism were not and have not been KJV Only. He includes Tennessee Temple Schools, Bob Jones University, Central Baptist Seminary, John R. Rice and the Sword of the Lord, H.S. Miller, A.T. Robertson, B.B. Warfield, James M. Gray, W.B. Riley, George Dollar, R.A. Torrey, Moody and Spurgeon, G. C. Morgan, B.H. Carroll, John Broadus, and many others. Lehman Strauss (1911-1997) taught at Philadelphia School of the Bible and pastored in Baptist churches, writing several books and commentaries. This booklet is a common-sense look at death and dying. It encouraged me as a pastor to continue to point believers to their faith in Christ as their only comfort when loved ones die or when they face the Jordan as well. I have traced over 20 different analogies to the believer at death which the Bible portrays. Strauss included these: that death is like sleep from which we will be awakened, like a departure in a ship to a distant land, and like an exodus, a “going out” from this world to the next. The booklet was first published by Moody Press. The edition I have was reprinted by the Sword of the Lord when John R. Rice was still editor, but does not contain a date. The World Congress of Fundamentalists was begun in 1976 with Ian Paisley and Bob Jones III as co-chairs. The first meeting was held in Usher Hall, Edinburgh, Scotland. I have three booklets of messages from the congress. Messages were delivered by Ian Paisley, Bob Jones and Bob Jones, III, Rod Bell, Wendell Zimmerman, Ed Nelson, Truman Dollar, Wayne Van Gelderen, Tom Malone, and others. In 1980 a second congress included Ray Comfort, Arno Weniger, Jr. and others. This is a booklet printed by Revival Literature of Asheville, NC. It is a reprint of the 1742 confession which was printed by Benjamin Franklin in 1743. It was the first Baptist confession which was printed for distribution in America and was the doctrinal confession of the Philadelphia Baptist Association which was formed in 1707. It only contains a short history and explanation of how the confession came about. Lumpkin gives a longer and more complete history. The Philadelphia confession represented the Calvinistic Baptists who were affected by the Great Awakening. Interestingly, this confession was greatly influenced by Benjamin Keach of London and his son Elias who was in America. By their influence it contained a new article on hymn singing.